When software engineer Rohan Kulkarni would sit at his desk at work, he’d get caught up in his daily tasks, methodically completing items from his to-do list. Sure, he’d have fleeting thoughts about taking a vacation, but those thoughts were often abstract, and rarely came to fruition. After all, where would he even go? This predicament might sound all too familiar to many of us, but the surprising part is that Rohan works for Expedia! How was it that the best places to go on vacation even seemed to elude a travel industry employee? His need for travel inspiration was the spark behind an idea he had one day: what if he could take a mundane task that he performs every day at work—say, opening a new tab in his internet browser window—and turn it into something that could inspire him to travel more? As with many ideas, he shelved it for another time. But when Rohan and his group attended Expedia’s biannual hackathon in June 2017, he took his idea and made it a reality. Every year, Expedia software engineers attend two internal hackathons, which are 48 hours of intensive coding to produce travel-related products or software. At the end, there’s a vote for the best creations. At this particular hackathon, each of Rohan’s team members had the opportunity to present their own ideas for the competition, but everyone opted to pursue his. The team got to work on Rohan’s vision: a Google Chrome extension that would inspire travel during everyday tasks. Rather than requiring someone to visit the Expedia website, inspiration could be found by simply opening a new browser tab—when the tab popped up, a beautiful photograph and city name would fill the screen. Some of his rationale was based on a recent survey that revealed more than 40 percent of travelers under 33 years old consider “Instagrammability” when deciding where to take their next vacation. The result was every bit as beautiful as Rohan hoped. Beauty aside, Rimor is incredibly simple to install and use. Rather than overwhelming you with options or sales tactics when you’re trying to get work done, it presents a stunning image and its location. You can save favorite locations for further explanation—by clicking a white heart that turns red when saved—or, you can learn more about that location by clicking on “inspire me,” which takes you to a page filled with activities that other travelers have endorsed for that particular city. You can even share the location image with your friends and family. Plus, if you do not like the image, just click the “refresh” icon or refresh your browser window, and you’ll be presented with a new city and photograph. Rohan’s team was thrilled with the result, but the real test was still ahead. On the third day of the hackathon, each of the competing teams presented their creations. Rohan’s team waited as 49 other teams presented, and when Rimor was selected to advance into the top 10, they were elated. While they did not ultimately win the hackathon, Rimor placed in the top three, and the team shared their experience with Aman Bhutani, President for Brand Expedia Group—Bhutani loved the idea and pushed to see it become part of the Expedia experience. In September/October 2017, Rimor was officially made available to the public, and Expedia plans to extend the concept by allowing users to learn more about cities, such as hotels in the area. The team also plans to continue adding new features to the extension, based on user feedback and their own vision. Click here to view Rimor in the Google Chrome store. Click the blue “Add to Chrome” button. Each time you open a new tab, you’ll see a new destination on your screen. From Santorini, Greece to Las Vegas, Nevada, you’ll enjoy images that remind you that travel is beckoning. In an age when inspiration can be hard to find, Rimor is a refreshing change. Most people plan to explore new places, but many of us don’t get around to it because we simply don’t think to take action. Sometimes, all we need is a bit of travel inspiration in an otherwise dull day. Meredith loves everything about traveling, except that it involves leaving her three cats behind. 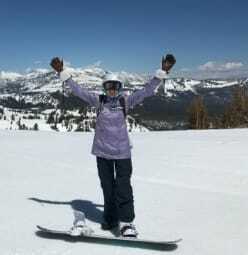 She’s a physical therapist-turned writer, who enjoys all sorts of outdoorsy travel activities, including snowboarding, rock climbing, and hiking—all of which serve to whet her appetite for her favorite travel activity: eating!